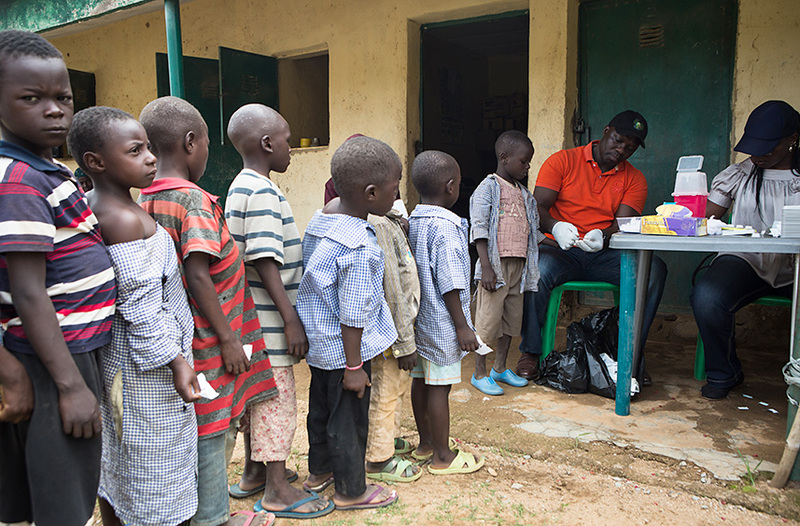 Schoolchildren line up for a quick blood test in Plateau state, Nigeria, to check for the debilitating parasitic disease of lymphatic filariasis. 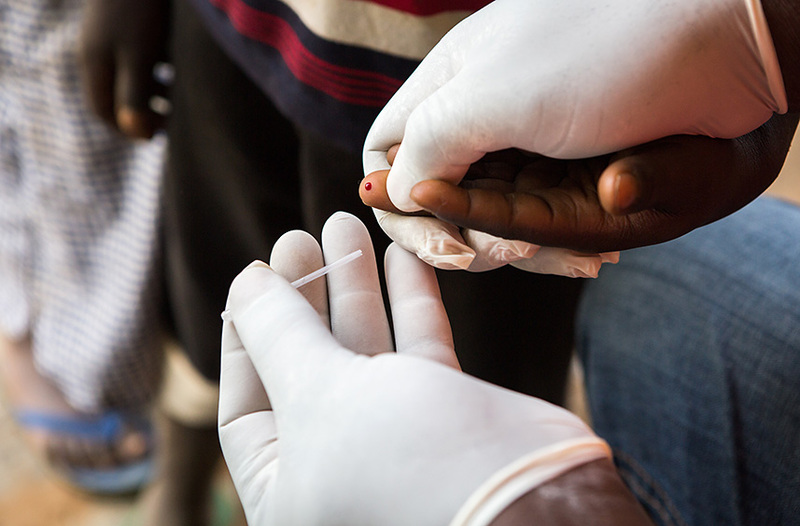 The finger-prick blood tests are part of a rigorous process the World Health Organization requires to demonstrate that parasite transmission has been reduced below sustainable levels with drug treatment. Herded outdoors by their teachers, bright-eyed children chatter, their blue-and-white school uniforms gleaming in a sharp but wiggly queue. Their excitement ebbs just a bit when they reach the front of the line and get a finger pricked by an adult wearing surgical gloves. The momentary pain of these schoolchildren in central Nigeria’s Nasarawa state portends significant gain for themselves, their families, and their country. Carter Center-trained researchers from the state Ministry of Health are testing the children’s blood for signs of lymphatic filariasis, a tropical infection that can cause painful, permanent, debilitating enlargement of the legs and other extremities. No such signs will be detected, demonstrating through hard data the success of a pioneering program to eliminate the disease as a public health problem in Nasarawa and adjacent Plateau state through mass administration of the drugs albendazole and Mectizan® (donated by GSK and Merck, respectively). "Over the past two years, we have tested more than 14,000 children ages 6 and 7 throughout the two-state area, and not one of them was found to be infected," said Dr. Gregory Noland, epidemiologist at The Carter Center, who helped train the testing teams. "In human terms, these children will never have to worry about being disabled by lymphatic filariasis." Lymphatic filariasis is caused by microscopic worms that are transmitted by mosquitoes. The parasites impair the body’s lymph system, often resulting in enormous, irreversible swelling known as elephantiasis, which brings secondary infections and fevers. It also can cause hydrocele, a massive swelling of the scrotum. In addition to pain and loss of mobility, people with lymphatic filariasis often experience stigma, and their families and communities suffer lost productivity. Sama’ila Simon (right) lives with an extremely enlarged right leg due to the parasitic disease lymphatic filariasis. He lives with his brother’s family and has never married, common for those with the disease due to the severe social stigma that accompanies it. 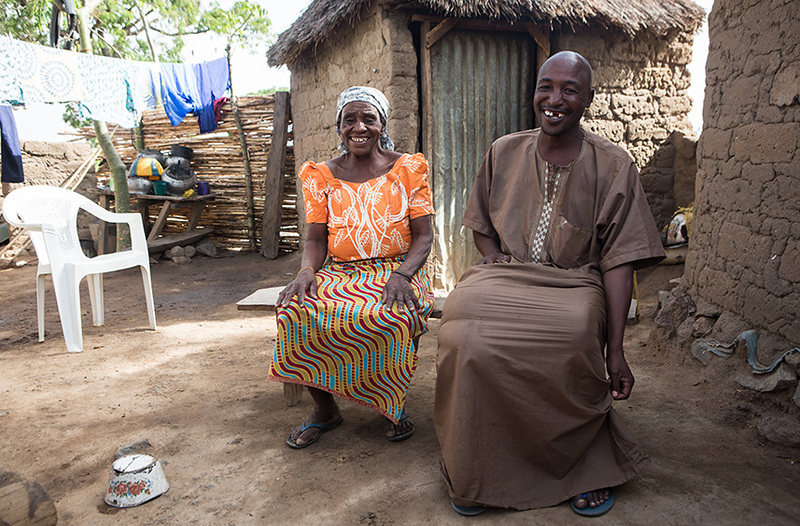 Sama’ila Simon, 48, knows the effects of lymphatic filariasis all too well. Before he learned from the Carter Center’s Hope Club support group how to care for his massively enlarged leg, he would get skin sores that would become infected, causing pain and a strong odor. In addition to his physical discomfort, the disease brought Simon social pain. "Some people—strangers in the streets and in the market—were saying I had done something wrong and God was punishing me for what I did," he said. The Hope Club helped him with that too. "I was gladdened to know that this was not caused by anything other than infection by a parasite," he said. "Some people today still believe it is caused by something else, but I know it is a parasite." 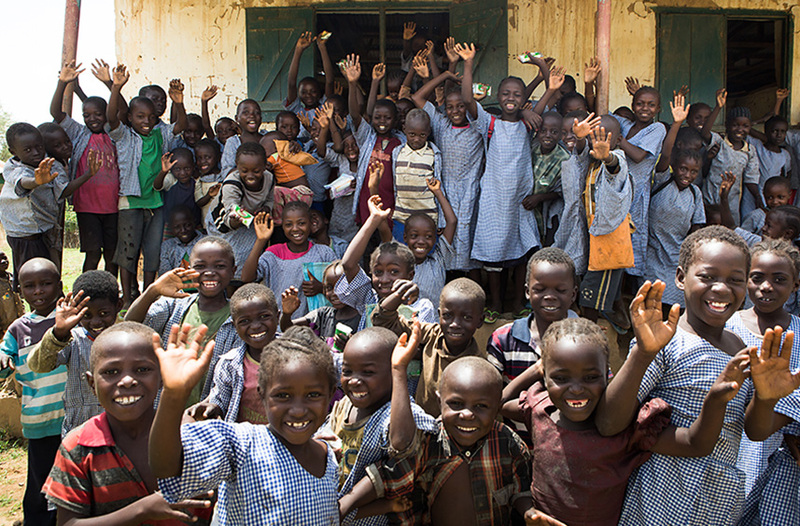 Now that lymphatic filariasis has been eliminated as a public health problem in two Nigerian states, these schoolchildren in Kinsachi village will not have to worry about the disease. 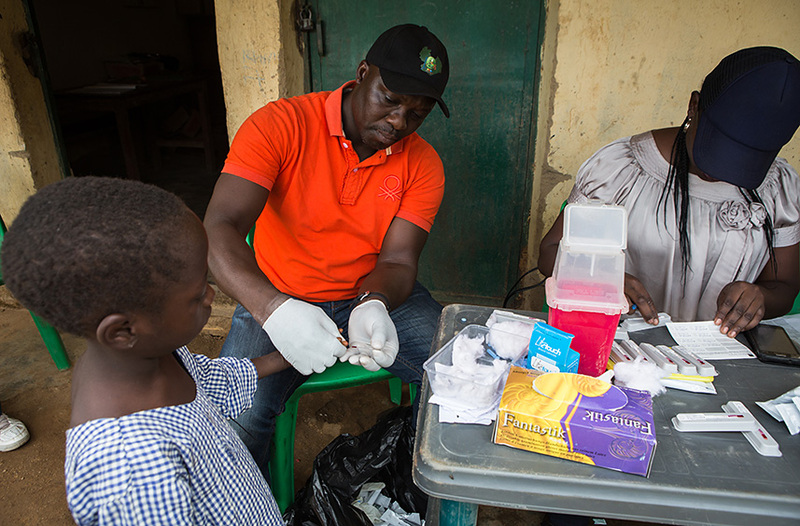 The finger-prick blood tests are part of a rigorous process the World Health Organization requires to demonstrate that parasite transmission has been reduced below sustainable levels with drug treatment. Several rounds of such testing must be completed over a five-year period after the halt of drug administration. Researchers must then continue to watch Plateau and Nasarawa states for importation of lymphatic filariasis from surrounding states until Nigeria achieves elimination nationwide. The goal is to eliminate the disease — and the need for the Hope Club — altogether.